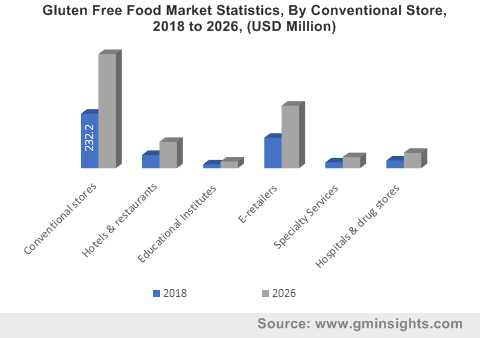 Gluten Free Food Market size is set to surpass USD 12.5 billion by 2024; according to a new research report by Global Market Insights, Inc. Growing consumer awareness regarding celiac problems, autoimmune problems and gluten allergy cases coupled with health issues which includes obesity and indigestion may drive gluten free food market demand. Increasing number of hypermarkets and supermarkets in China, Germany, UK, and the U.S., which has upsurge awareness regarding these food products may propel product demand. It is a protein which is found in rye, barley, wheat and other related byproducts. Increasing food intolerances and allergies accompanied with rising consumer health concern should drive market demand. Growing incidences of celiac diseases in the U.S., Germany, UK, and France with stringent government mandates by FDA and EU Commission regarding labelling of nutritional products should drive gluten free food market demand. Gluten free food market size from cereals & snacks may surpass consumption at over 120 kilo tons by 2024. These are used in various cereals products which improves cholesterol levels, promotes digestive health and increases energy levels. These products are used in snacks as they avert sugar content, detox body and eliminates carbs and calories, thus increasing the product demand. Gluten free pizza & pasta market demand may register significant growth at over 8% up to 2024. These products are now replacing traditional pizza owing to several benefits which includes lowering of cholesterol, aid in gaining less weight, manage insulin levels and helps with skin ailments, thereby stimulating gluten free food market growth. Hospital & drug store for gluten free food market demand is likely to register growth at about 8.5% over the foreseeable timeframe. Several drug stores are offering gluten-free sections or departments pertaining to rising demand from coeliac patients along with adverse health risks, which may accelerate industry growth. The U.S. gluten free food market demand may witness growth at about 9.5% over the forecast period. Growing food allergies and intolerances owing to wheat products in the dietary supplements may drive the regional product demand. Increasing celiac problems in the region along with regulations by FDA regarding health benefits may favor industry growth in the region. Italy gluten free food market size is anticipated to surpass USD 820 million by 2024 due to increasing bakery products and pizza demand. Increase in working population along with hectic lifestyle has led to rise in pizza demand in the region. Rise in variety of products in the European supermarket mainly frozen pizza is mainly increasing product demand. Japan gluten free food market demand should register significant gains at around 9% over the predicted timeframe. Consumers are keen on maintaining a healthy diet and health conditions related to metabolic syndrome have encouraged a substantial number of consumers to seek products with health benefits and nutritional value, thereby driving regional growth. CEREALTO, Wheafree, Glutafin, DI Manufacturing and Prima Foods are the key industrial players in gluten free food market. New product launches, and strong R&D may enhance product portfolio, which in turn boost the industry growth. Most of the researchers are developing and focusing on novel applications of legume flour product to increase gluten free demand which in turn may accelerate gluten free food market over the forecast timeframe.